This interview was first seen on Transworld Motocross here. Vicki Golden is defined by her many accomplishments. She is the first woman to qualify for an AMA Supercross night program, as well as the first female to qualify for an AMSOIL Arenacross Lites Main Event. Golden is a three-time X Games medalist and Loretta Lynn’s Amateur National Champion. Although she fell short of winning an ESPY Award in 2014, being nominated for Female Action Sports Athlete of the Year is a very notable achievement. It’s obvious that Vicki Golden is also defined by the fact that she lacks a Y chromosome. The attention doesn’t bother Golden, who is used to competing with the boys. In fact, it’s pretty much all she has ever known. Growing up with a father and brother who raced motocross, Vicki was soon banging bars with anyone that could keep up with her. The Southern California native and long-time ProX athlete knows no bounds. And, as she’ll explain below, the key to happiness involves an engine and throttle. 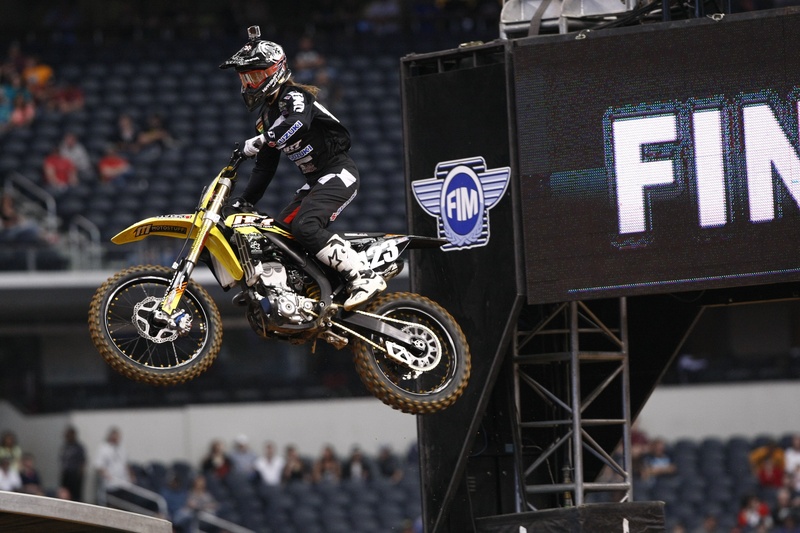 Vicki Golden proving herself at Supercross. Golden: I’ve obviously changed my career path a little bit. I transitioned from motocross racing to freestyle motocross. That has been going really well. I have been learning tricks and am slowly learning the backflip. 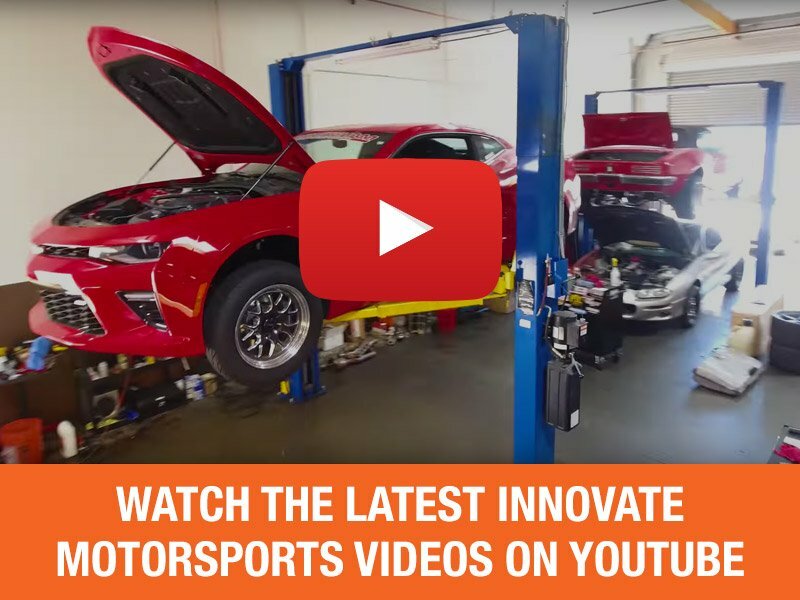 It has been a big move away from the norm of racing. I got linked up with Travis Pastrana to film with ‘Action Figures.’ I was out filming at his house in Maryland and jumping into the airbag. I had a brain fart and landed feet first into the airbag. My knee was already blown out, and the impact forced my knee to buckle inward. My fibula went the other way. I didn’t know my leg was broken for two weeks. Before that incident everything was on the right track. 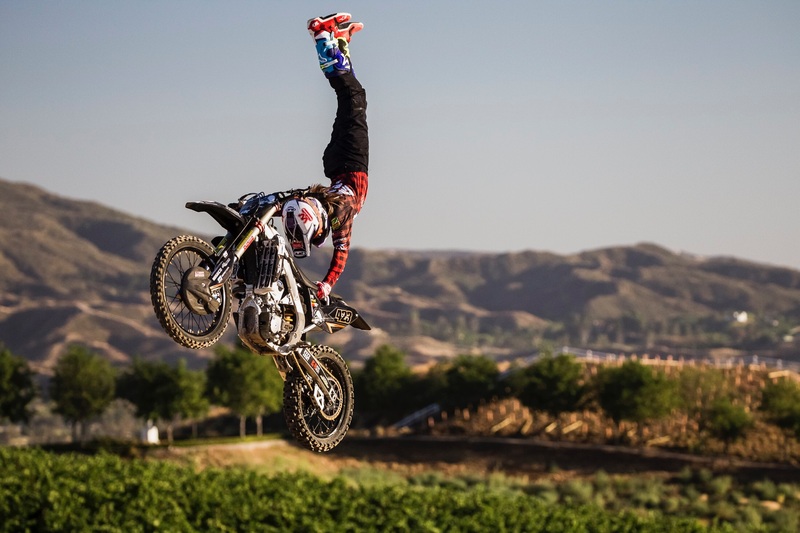 Why did you make the switch to freestyle motocross, especially after achieving success in racing? Golden: I had success, although it wasn’t to the level of success that I was aiming for. My goal was to make Supercross night shows, and technically I did that. Unfortunately, I got the Epstein-Barr virus my first year. When I should have called it quits that year I decided to keep pushing ahead. It seems Golden has no problem displaying her tremendous bike skill in FMX as well. Were you aware of the severity of the Epstein-Barr virus? Golden: The sickness didn’t make sense to me. I didn’t know what it really was. I thought it was an excuse, so I continued to ride, train and race. I soon realized that it was a real problem. I dug myself a big hole that I couldn’t get out of. I still made a Supercross night show [note: at the Las Vegas finale in 2015], which was my goal, but it took me all year to figure out that something was wrong. After that first year of Supercross, I took the entire summer off from doing anything. I couldn’t even withstand the heat. I remained inside just to do everything I could to get better, which was to do absolutely nothing. I got better for Supercross the following year, but I couldn’t handle the training, intensity and travel. Supercross is the pinnacle of two-wheel racing, and my body couldn’t handle it. I decided if I couldn’t race to the best of my ability, then I shouldn’t do it at all. At that point I switched over to freestyle motocross, which was something that I had planned on doing anyway. Granted, I was hoping to get another two years of Supercross in the books before making the transition, but that didn’t happen. I’ve had a lot of success in a short period of time. On top of that, I’ve never had more fun than riding freestyle. It’s a change for the better. How does preparation for riding freestyle differ from racing dirt bikes? 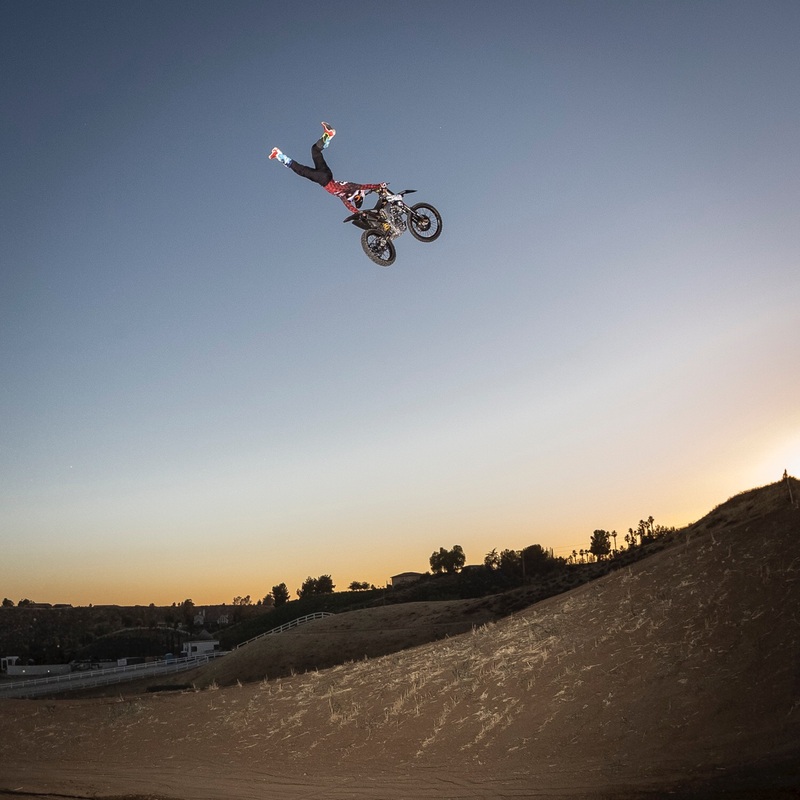 What target goals do you have set for your new career in freestyle motocross? Golden: My ultimate goal was to be on the ‘Nitro Circus Live Tour,’ which happened way sooner than I expected. Initially, I thought it might happen after putting in two hard years of work, but I have been able to do several shows already within a year. It has been a great experience. My ultimate goal is to start doing the backflip, and basically perfect it. I’m getting flips around, but they’re not pretty or 100 percent consistent. I want to get the flip to dirt sooner or later. My focus has also been to learn as many tricks as I can. Based on this photo, we think Vicki is doing pretty well at nailing scary tricks. Scary to us, anyway. You have won three X Games medals, qualified for Supercross, and competed at the highest level of a male-dominated sport. What has been your crowning achievement thus far? Golden: It’s hard to choose one particular thing. Looking back, the one accomplishment that sticks out was qualifying for a Supercross night show. That’s mainly because I failed so many times before it actually happened. I was sick. I had no energy. However, it’s not in my nature to give up and quit. I kept showing up at each race, hoping and praying that I would be able to withstand one qualifying lap that was fast enough to make the night show. It was the hardest thing ever. About 20 seconds into a fast lap I was trying my hardest not to puke. On top of it, getting over the Epstein-Barr illness was a huge challenge. As an athlete you’re taught to keep grinding it out so that you can get better, stronger and faster. Was it hard to take a step back when you had Epstein-Barr and literally do nothing in order to get better? Golden: To this day, it has been the hardest thing to get over. A broken bone isn’t really a big deal, because there’s a timetable for a return. You can take steps to improve your condition; whether it’s physical therapy or electric stimulation. When you have Epstein-Barr, you can’t do anything. It changed my mindset. Doing nothing made me depressed for months on end, because I had no clue about when I could get back to training and riding. On top of that, I was terrified to regress. I knew that I could work out, but I was afraid of pushing myself too much. I questioned everything. It’s still hard to overcome that feeling, because as a racer you’re constantly looking for more. "The truth is that I love riding my dirt bike. That's what it comes down to." Is your driving force to break down barriers and redefine stereotypes? Golden: The perfect response would be to say that, yes, I do it for that reason. The truth is that I love riding my dirt bike. That’s what it comes down to. I don’t make a list of things that a woman hasn’t done and target those goals. That’s not how my mind works. Sure, some things are more desirable if they haven’t been done, but I don’t base my existence on that. I do whatever it takes to keep a job riding my dirt bike. I did that for racing, and now I really love riding freestyle motocross. I ride with a great group of guys and get to have fun every single day. You’ve held steadfast to a group of key sponsors through the years. Why? Golden: I take pride in keeping long-lasting relationships with my sponsors. That’s just who I am. Maybe that’s why I never worked out very well on race teams, because I always wanted to remain with the sponsors that take care of me. Wiseco has been that way for countless years. They take care of me, and the same goes with ProX. Literally, ProX is one of the best sponsors to have, because they make practically everything I need to ride. The quality of each piece is great, as well. It’s not like they’re sending me 20 of one item because the part doesn’t last. ProX stuff holds up great. I put a piston in my freestyle bike, and it lasts twice as long as any other piston. Nobody likes doing top-ends on a four-stroke! Also, the ProX team are very good at listening to my input. There’s an open line of communication. It’s nice when a sponsor will call and check in, especially considering I handle my own management and am busy riding. ProX looks after me. I run ProX sprockets, chain, brake pads, sprocket bolts, brake lines, clutch cable, piston…pretty much anything ProX makes is on my bike. What’s next in the world of Vicky Golden? Golden: I’m going to do a few more shows for ‘Nitro Circus Live’ in the Pacific Northwest once I get the cast off my leg. I’ll grind away at therapy in order to fast-track the time it will take to get back on my bike. The plan is also to do some filming with Travis Pastrana in Oregon. 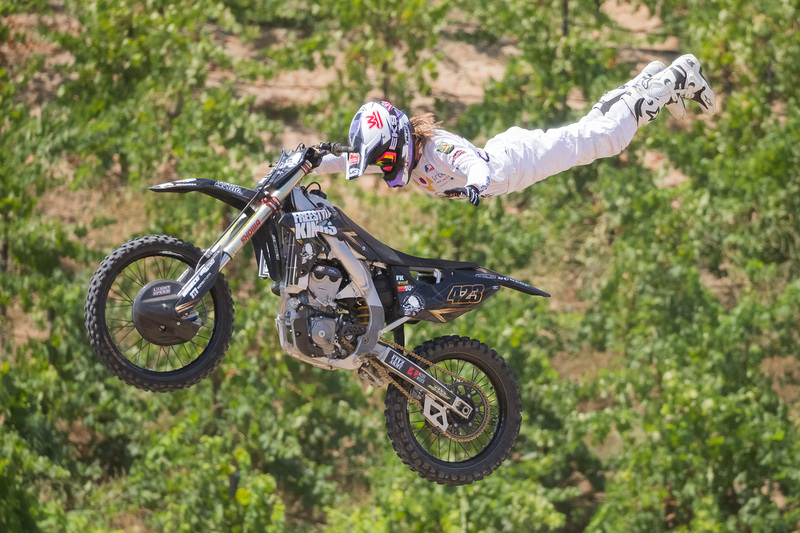 This Fall I will do the whip contest at the Monster Energy Cup, which should be fun. The goal is to keep things fun, because it has been an enjoyable career.